I've been exposing TobyMac as a Christian fraud for many years. The album cover to the left is Toby's new and latest album which just came out on August 28, 2012. Look at the All Seeing Eye. This latest album further evidences who Toby McKeehan serves, that is, Satan! Sadly, most young people today don't care. They are knowingly following the New World Order, selling their souls to the Devil. 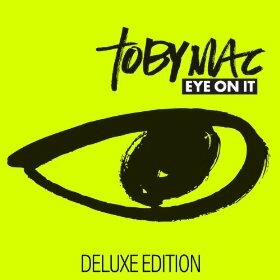 You can hear a short clip of Toby's new album and song, EYE ON IT at Amazon. 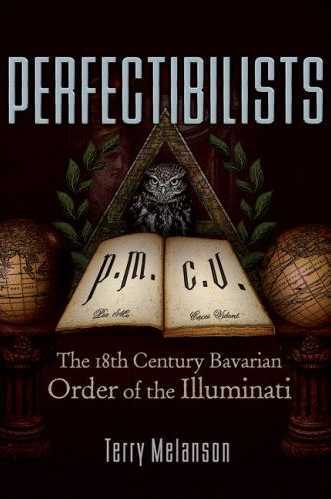 Please read, New World Order Occult Images In CCM Music! You either want to know THE TRUTH or you don't. It is obvious that Satan is behind the music industry (and that certainly includes CCM). Toby McKeehan (born 1964) is now 47 years old in 2012. The Great Pyramid is an occult symbol showing one's allegiance to the NWO. Satan is everywhere today! Below left: A photo taken from the main website of the International Churches of Christ (ICOC). Below right: The back of a U.S. one-dollar bill showing the Masonic pyramid. Above left: Ozzy Osbourne; above right: The Back Street Boys (although these are secular Rock idols, you can see that CCM and secular groups alike show allegiance to The Beast system (i.e., the New World Order and the coming Antichrist who will be its leader), by incorporating The Great Pyramid onto their album covers. 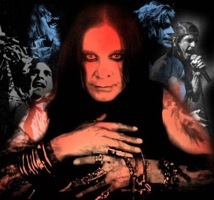 Notice how Ozzy's arms and head subtly form a pyramid. Max Lucado subtly does the same thing on Fearless pictured below. In the preceding picture, do you see how Max Lucado subtly and cleverly uses a pier and a person in snorkeling flaps to form a pyramid? Also note that the person forms the capstone of the pyramid, and they are detached, exactly like the detached pyramid and capstone (top stone) on back of every U.S. one dollar bill. The significance of this occult (hidden) symbolism is the same as the earring in the right ear fad that homosexuals began in the 1980's in Florida. It spread nationwide quickly. Without saying a a word, a man is consider a homosexual just by wearing an earring in his right ear. 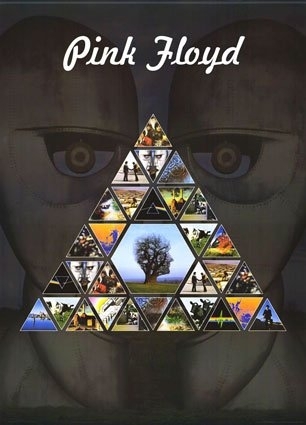 Likewise, if you want to impress the movers and shakers that have the power to make you successful in this wicked world, the best way to move up the Devil's food chain is to promote The All-Seeing-Eye and The Great Pyramid, but subtly in everything you do. 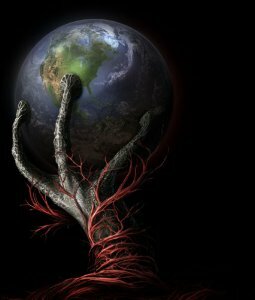 The most successful worldly people are the one's who most subtly promote Satan, because that is the Devil's goal in this evil world, i.e., to deceive people without them knowing it! Satan doesn't need any more idiots who openly worship Satan; the Devil needs people who appear as Christians, and can win the hearts and minds of the masses, while simultaneously injecting them with spiritual poison and leading them into Luciferianism. If you can do that my friend, then Satan will make you rich and famous very quickly. Contrary to what many people think, I do not preach against contemporary sounding music. I play pedal steel guitar myself, and thank God for the blessing of music. There's nothing wrong with breaking away from the old classic hymns of the faith, although I certainly think they ought to be preserved and cherished. What is evil is the Contemporary Christian Music [CCM] INDUSTRY, which is owned and controlled by occultists. This is plainly evident from all the occult symbols that saturate the artist's album covers. P.O.D. is demonic. Amy Grant promotes the occult. Satan signs are flashed by the artists at ALL their music concerts. The love of money is truly the root of all evil, and the CCM industry rakes in billions-of-dollars annually. All of the CCM artists being idolized and promoted are apostate, lewd, worldly, carnal and some even blaspheme Jesus Christ. You'll be hard-pressed to find the mention of the precious name of Jesus in most of CCM's songs. Christian Rock is nothing more than a saved teenager's excuse to listen to Rock music in these Last Days. The Heavy-Metal band, As I Lay Dying falsely professes to be a Christian band, and is sadly praised by ChristianityToday (founded by apostate Billy Graham) as a Christian group; but they were the opening band at OZZFEST! Music is a stronghold in a teenager's life, preventing them from seeking God. The singers are worldly, leading young people to think that once you are saved there won't be any changes in your life. The message is clear: You can live like the Devil, dress filthy, watch dirty movies, talk like the heathen, party like the wicked; and still please God as a Christian. In sharp contrast, the Bible tells us to fear God and depart from evil (Proverb 3:5-7). The distance between the Church and the sinful world is decreasing. As the Church becomes more worldly; so also is the world becoming more churchy. This ought not be! The CCM industry is evil. The gospel message is not only hidden, it is corrupted. I challenge you to find ANY mainstream CCM artist's website which preaches the gospel message. You won't! They love the praise of men more than the praise of God (John 12:43). They claim to love Jesus with their hand over their mouth. They profess to love a God whose Word they dare not preach to their fans. Amy Grant has stated . . .
Oh my. As Christians, we should all be trying to get souls saved. Amy Grant has made tens-of-millions of dollars through her musical career, professing to be a Christian; but she has not glorified God when she neglects to use her massive public influence to share the gospel with the lost. I do not condemn anyone, for the Lord Himself does not condemn anyone (John 3:17). However, the Bible does condemn humanity, all of us, as guilty sinners (Romans 3:19). The reason why I expose the CCM industry and its participants is because they are pulling on the same rope as the Devil. Proverb 3:7 tells us to fear God and depart from evil; not love self and embrace sin. I love people in the Lord, and I certainly do not point fingers at anyone for their sins; but taking a Biblical stand for God against evil influences in society is our duty as believers (Ephesians 5:11). I am not condemning Amy Grant and Michael Smith; but rather, am exposing the demonic CCM industry they support. I am exposing Amy's public influence upon millions of young teenagers, who now have the attitude that they shouldn't win souls, since they're not preachers. Proverb 11:30 says a wise person wins souls. That includes everyone! Daniel 12:3 speaks of those who will shine as the brightness of the stars in eternity, for turning many to righteousness, i.e., the righteousness of Jesus Christ which brings salvation (2nd Corinthians 5:21). Is Amy Grant turning teenagers to Jesus Christ, or to the world? You know the answer, the world. I only have a small website compared to all of the mainstream CCM artists. I have no concerts. I have no massive public influence; but I use what influence God has given me to warn people of the everlasting punishment to come in the Lake of Fire, for all Christ-rejecters who die in their sins. I care. I don't want anyone to go to Hell. That is exactly how God feels (2nd Peter 3:9). If we are to exemplify Jesus Christ in our life, then we ought to care about the souls of others. Where will they spend eternity? Every time I hear of a famous person passing away, I wonder if they went to Heaven or Hell? It's one or the other friend. Where will you spend eternity, smoking or non-smoking? There is nothing wrong with contemporary music, or making up your own songs. 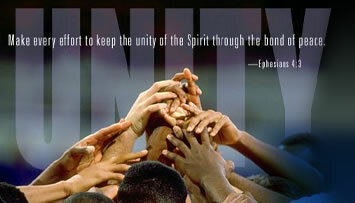 In fact, that's exactly what the Bible teaches we should do (Ephesians 5:19). But when you turn the grace of God into a money-making business, setting aside the Gospel in order to sell worldly music labeled as “Christian” to worldly religious youth, then you've crossed the line with God. God says He vomits lukewarm believers out of His mouth (Revelation 3:15,16). The entire CCM industry is lukewarm. They claim to love God and want to serve the Lord; but in actuality, they serve the Devil by serving themselves, making tons of money, and the Gospel is nowhere to be found. Many CCM artists and their fans will claim that the lyrics of the music contain the Gospel. That's a dirty lie of the Devil. I've listened to their lyrics. Most of them don't make any sense, and the ones that do only employ religious lingo to give the appearance of being Christian, but there is no integrity of meaning. The best of CCM music today is loved by Catholics and other false religions, because the message is so vague. The very essence of New Age is that there are many paths to the light. New Age deceitfully claims that all religions are acceptable, because they all recognize the same god, i.e., the light. In sharp contrast, the Word of God proclaims that Jesus is the Son of God, the Christ, and the ONLY path to Heaven (John 14:6). The Bible teaches that manmade traditions are a road to Hell (Mark 7:6-13). This means that the Catholic Church is of the Devil. You can't have it both ways. The Seven Sacraments are of the Devil. Nowhere does the Bible require a person to keep Sacraments to be saved and go to Heaven. Yet, Catholics teach Sacramental Salvation. In fact, the Vatican teaches that all non-Catholics are going to Hell. That's what their official dogma teaches in Vatican II. Yet, the Pope today embraces Islam and says they can go to Heaven following Islam. Don't you see, it's all a pack of demonic lies intended to blind you, to lead you into damnation with them. You'd better obey the Bible and forsake the religious whore of Catholicism. CCM artists love Catholicism and never speak a word against it, because they'd lose most of their fans. The CCM industry is evil, and it is controlled by Satan, the god of this filthy world. Amen for contemporary music if it's from your heart; but if you want to be a star, you're an idolater. And your fans are idolaters. The group Avalon are worshipped as gods on stage. It is sickening. They are popular with Southern Baptist churches, sadly. America's idolatrous worship of celebrities has crept into our churches. Jesus should get all the praise. Watch the average CCM concert and you'll see the artists being praised as if it's a Van Halen concert. That is idolatry. I realize that many of the CCM artists verbally give praise to God; but the Gospel is watered-down, sin is not preached against and nothing more than a Rock concert takes place. That's not going to change America for God. I hope someone is listening. So what is the solution? Forget mainstream CCM artists who sell their music. There's plenty of Gospel singers in the world who aren't out to make a buck. I always give my music away to people. Why sell what God gives us as a gift? My ministry is free, from my heart. I sell nothing, nor do I receive donations, never. People have offered, and I am humbled, but this is a work for God, from my heart where God lives. And He lives in your heart too if you're saved (Romans 8:9). Amen! I am against professional sports too. The whole industry is corrupt. It's all about making billions-of-dollars. I am all for local little league teams. We've lost the purity of little league in America with the rise of professional sports. Do you know how rotten professional sports has become? They hire their own doctors to send injured players back onto the field, who shouldn't be playing. It's all about money. It's sickening that a football player can be paid $10,000,000 a year (notice I didn't say “earn”) who never finished high school; but a surgeon who spent 12-years in training gets $500,000. CCM is no different than professional sports to me. I guarantee you that wherever you find mainstream CCM music, you'll also find liberal churches that use the corrupted New International Version of the Bible. The women all wears pants, which is immodest. Feminism abounds in such churches, and so does divorce as a consequence. The dire need of our time is preaching preachers who preach the Word of God. Instead, America's pulpits are filled with psychologists, who combine the Scriptures with secular psychology, and the Gospel is abandoned. The Gospel begins with the knowledge of sin, preaching of a Hell that burns with fire and brimstone, where we all deserve to go. You don't hear anything like that from today's pulpits. There can be no salvation without the Law, i.e., acknowledging that one has violated God's Law and deserves to burn in Hell forever (Romans 3:19-23; 2nd Thessalonians 1:8-9; Revelation 20:11-15). CCM artists are as wishy-washy as are the apostate churches who invite and support their worldly music. Jesus is precious! We need revival in America. WHAT IS A FUNDAMENTALIST? (by Dr. Hyles) | The Satanic Attack Against Fundamentalism!